The Private Wealth guide provides expert legal commentary on the key issues for high net worth individuals. The guide covers the important developments in the most significant jurisdictions. Sullivan & Cromwell LLP has advised many of the world’s most influential families for more than 135 years, on all aspects of their business and legal affairs, from complex transactions to family business governance and wealth preservation. Through 12 offices on four continents, we provide highly integrated legal services to the world’s leading families and companies in their most important domestic and cross-border matters. The firm prides itself on being at the intersection of private client, trust and transactional advice and can advise on and execute any type of transaction, in any industry, economic climate or geographic region. We would like to thank Katherine J. Nixon and Samuel E. Roth for their valuable contribution to the firm's chapter of the Private Wealth Guide. The world of international estate, trust and tax planning continues to evolve. Decades of globalisation combined with unprecedented mobility of the world’s wealthy has made it common to have clients whose residences and assets range across multiple jurisdictions. This can lead to planning challenges during life and at death as families are often affected by multiple, and often conflicting, tax laws, rules of inheritance, treaties and cultural norms. As a result, international private client lawyers must work closely with legal advisers in many jurisdictions to ensure that advice is not being given in isolation, and that all factors affecting a client’s planning have been identified. Understanding and appreciating the cultures (both legal and national) of the various jurisdictions is also vital, and lawyers who do so will be increasingly valuable, whether in non-contentious planning or in trust and estate litigation. An effort to bridge cultures and languages will also make mistakes much less likely. Lawyers who function as a team, who respect the intricacies and unique aspects of each legal system, and who recognise that an appreciation of language and culture is fundamental to successful cross-border work, will have enormous advantages over lawyers who see multi-jurisdictional planning or litigation as separate pieces where each lawyer has responsibility only for his or her jurisdiction. 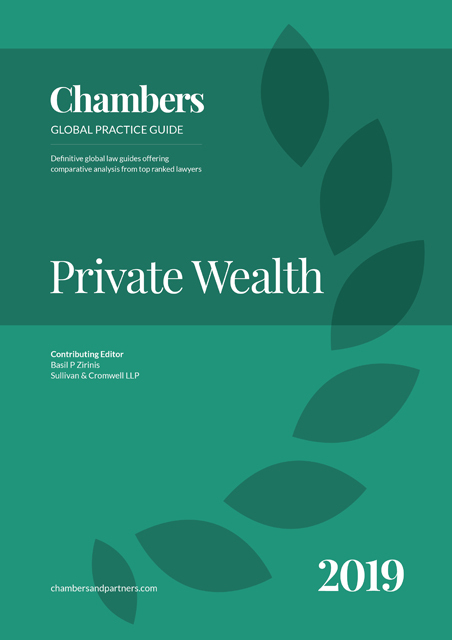 The Chambers Private Wealth Global Practice Guide is designed to help encourage and facilitate this cross-border cooperation. A few recent global trends in the law that relates to families, their businesses and their planning are discussed below. The most dramatic force of change in the international private client world continues to be the global drive for transparency. Governments are increasingly focused on cross-border arrangements and structures and have implemented regulatory schemes that require the exchange of tax-related information. For example, the United States overcame initial resistance to obtain near-complete international compliance with the Foreign Account Tax Compliance Act (FATCA). The Common Reporting Standard (CRS), the reciprocal automatic information exchange agreement developed by the Organisation for Economic Co-operation and Development (OECD) has been adopted in over 100 jurisdictions; reporting commenced in 2016 and will fully come into effect this year. CRS requires entities (including trusts and foundations) to report information on controlling persons. For entities, the controlling persons are generally the individuals who exercise control over the entity or who have a direct or indirect controlling ownership interest in the entity. For a trust, the controlling persons are defined to include the settlors, the trustees, the protectors (if any), the beneficiaries or class of beneficiaries, and any other natural persons exercising ultimate effective control over the trust (whether directly or indirectly). Of course, few of these individuals (who may be resident in numerous jurisdictions) actually control a trust, yet the broad reporting requirements are creating significant compliance burdens and challenges for trustees and financial institutions dealing with trusts. The global reach of CRS has also made the co-operation of teams of advisers across multiple relevant jurisdictions that much more important. Much has been written about the fact that the United States is not a party to CRS and some commentators have suggested that the United States has become an attractive jurisdiction for non-US persons wishing to maintain their privacy. In addition to an increased emphasis on the automatic exchange of information in programs that purport to make the information available only to tax and law enforcement authorities, some governments and organisations have pressed for even greater transparency, demanding public registers. For instance, in spite of legal challenges, the European Parliament and Council are considering legislation that would authorise limited public access to national registers of trusts held in the European Union. If enacted, these and similar regulations would have serious implications for clients who wish to keep their legitimate affairs private from the general public. The United Kingdom (UK) has already enacted similar legislation in the context of shareholders of corporations, which requires the disclosure of persons with significant control. Since 2016, all UK-incorporated companies and limited liability partnerships (LLPs) have been required to maintain and hold open for public inspection a register of natural persons with significant control. Furthermore, beginning this year, UK-resident trusts as well as trusts with UK assets or income are required to provide information for inclusion in a new UK register of trusts. While the register will be available only to government institutions for the time being, some organisations are pushing for public access. The substantial reporting burdens of these types of regulations have already had a notable impact on the offshore trust world. Many smaller trust companies simply do not have the resources to comply with the complex regulations, and the risks of incorrect reporting often outweigh the benefits of taking on clients from certain jurisdictions. Individuals have faced increased scrutiny over the use of various tax planning vehicles. An increasingly intense debate has emerged regarding the morality of these structures which, though perfectly legal, are thought by some to be morally incorrect. The Panama Papers hacking in April 2016 and the Paradise Papers hacking in 2017 have fuelld this debate. The focus on tax reporting mechanisms is global. For example, Russia has recently strengthened its anti-avoidance and anti-offshore tax regime. Under these rules, Russian resident individuals are taxed on the undistributed profits of foreign structures if the resident individual is considered a controlling person of such structure. Many countries in Latin America have enacted Controlled Foreign Corporation legislation and taxation. More and more countries, such as the UK and India, have enacted general anti-avoidance rules which empower the revenue authorities to deny taxpayers the benefit of arrangements that are structured solely to avoid taxes and have no other commercial substance or purpose. In this context, it is not surprising that the so-called revenue rule, which was described in Attorney General v Lutwydge, an 18th century English case, and generally allows courts to decline enforcement of foreign tax judgments or application of foreign revenue laws, has been eroded. A dramatic example of this is Pasquantino et al. v United States, 544 U.S. 349 (2005), in which the United States Supreme Court held that the evasion of foreign taxes may be prosecuted under US criminal laws. Another important example is a recent decision of the Court of Appeal of Guernsey, which has provided guidance on the limits of a trustee’s duty to keep the affairs of a trust confidential when faced with a possible criminal tax prosecution from another jurisdiction. In Re B, Guernsey Judgment 35/2012(Court of Appeal, 11 July 2012), trust beneficiaries opposed the disclosure by a trustee of confidential information in response to a summons issued by a French investigating magistrate. The Guernsey Court found that the trustee faced a real and imminent risk of criminal sanction for failure to comply with the summons, and permitted the trustee to disclose the information sought. These cases also point to the increasing criminalisation of tax and compliance advice. In recent years, the UK Criminal Finances Act, the US Foreign Corrupt Practices Act, and similar laws have threatened private client advisers with criminal penalties for their clients’ misconduct, effectively co-opting them into the oversight of client behaviour. Under the UK Criminal Finances Act, a corporate body (eg, a law firm or a financial institution) that fails to institute policies designed to prevent the facilitation of tax offences or money laundering by its employees could itself be subject to substantial fines or termination of licences. The world is in the middle of the greatest generational transfer of wealth in history, and cross-border estate and trust litigation has never been busier. Trustees find themselves entangled in a rising number of complex and costly cross-border disputes, often serving as the target of aggrieved beneficiaries (or excluded family members) from, for example, jurisdictions that have forced inheritance laws and that often do not recognise trusts. Whether representing fiduciaries or challengers, anticipating litigation can go far towards increasing the likelihood of obtaining a favourable result (whether through the courts or negotiated settlement). The greatest risks in multi-jurisdiction trust litigation come from the potential clash of laws and procedures of the different countries, yet these inconsistencies also create opportunities for surprise and victory. The litigation team that truly understands the intricacies in each jurisdiction and appreciates the contrasting cultural forces can exploit the gaps that are created to their substantive and procedural advantage. Perhaps the most significant change since the 2017 edition of this Guide is the increased political volatility worldwide. Brexit in the UK, the 2016 presidential election in the US, multilateral conflict in the Middle East and the consolidation of authoritarian regimes around the globe are just a few examples of fluctuating political landscapes. The substantial changes to legislation, policy and politics which resulted have created risks and opportunities for clients who live and work across multiple jurisdictions. To provide sound advice, advisers must understand the full import of political changes worldwide and their potential consequences. All of these trends and forces – transparency, scrutiny of tax planning, the increase in trust and estate litigation, political volatility – will continue and will receive the most publicity. But of course, the world of private client advice does not involve only these areas. Much of our work relates to helping families structure the succession of wealth in responsible and lasting ways, preserving long-existing family businesses, encouraging family harmony and protecting family assets for both current and future generations. These needs will also continue and grow. New challenges that are emerging include, for example, adapting current laws and structures to evolving methods of reproduction due to scientific and medical advancements. These range from the increasing use of surrogacy arrangements to the birth of children from frozen embryos after one or both of their biological parents are dead, and even to posthumous conception and reproduction. Laws to address issues of inheritance rights and the definition of such terms as "issue" and "legitimate" in these contexts either do not exist or conflict among jurisdictions. Digital assets, including virtual currencies such as Bitcoin, mark another new territory that national legal systems will need to address.